Registrare adesso e approfittare dei vantaggi di tutti servizi forniti per utenti. Non c'è la possibilità di comprare una quantità specifica di prodotto. We are happy to invite you to MS Vilnius International Coin Fair 2018! This event is created specifically for numismatists and investors in collectors` commodities. MS Vilnius International Coin Fair 2018 has an aim to become the biggest numismatic Fair in Central, Eastern and Northern Europe. The event is organized by online auction marketplace Millenium State based in Luxembourg with representative body in Vilnius. The MS Vilnius International Coin Fair 2018 is the first international numismatic event at this scope held in the Baltic States. The mission of the Fair is to promote numismatic traditions in the region and investments in collectors` commodities. The trade show is expected to bring together not only professional numismatists, coin lovers and investors, but also the rapidly growing community of individuals looking for a reliable and safe place to invest their savings. This international event will gather investors and collectors from various places, such as Germany, Poland, Scandinavia, Italy, Spain, Russia, France, the Baltic States and other European countries. Collectors, traders, investors will be encouraged not only to buy, sell, trade, bargain but also to discuss the most actual topics in numismatic world in a number of sessions organized during exhibition. Within two days, dozens of traders, dealers are going to present their coins, medals, banknotes, decorations, investment and souvenir golden and silver items in Vilnius. MS Vilnius International Coin Fair 2018 is an attempt to gather together salesmen, collectors, investors in one place and create unique and friendly atmosphere building trust and security in collectors community. Historically Vilnius has been always linking the West with the East, the North with the South. 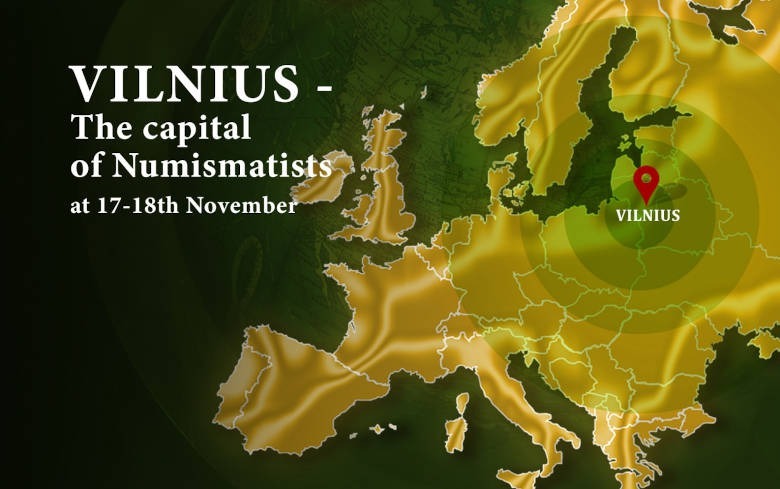 This is why numismatic event will take place in Vilnius, which is one of the most business friendly capital cities in Central and Eastern Europe. We wish you a pleasant experience in the collecting world!